The reaction from the Central Statistics Office (CSO) to questions about its employment of CACI as a contractor has been “nothing to see here” — the €6.7 million deal for this census with CACI was a repeat of an old arrangement and the CSO itself controls all the crucial data, the “reassuring” press release said. 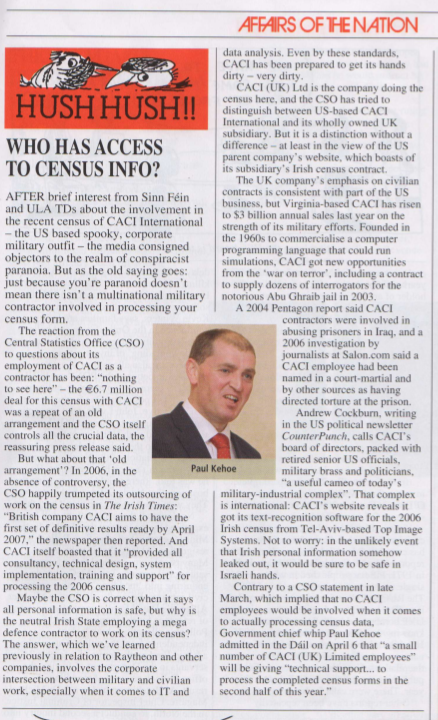 But that wasn’t exactly the line in 2006, when in the absence of controversy the CSO happily trumpeted its outsourcing of work on the census in the Irish Times: “British company CACI aims to have the first set of definitive results ready by April 2007,” the newspaper enthused in May 2006. CACI itself boasted that it “provided all consultancy, technical design, system implementation, training and support” for processing the census. Now, as the enumerators try to sweep up the last of the census forms from some recalcitrant households on the anti-war left and conspiracist right, the CSO could not tell Goldhawk whether there had been unusual levels of non-compliance with the 2011 census, or even whether the office plans to assemble, ahem, statistics about any protests: in the run-up to April 10th, various online activists discussed spoiling their census forms, or inserting a letter objecting to CACI’s role. There’s no reason to disbelieve the CSO when it says all personal information is safe, but why is the neutral Irish state employing a defence contractor to work on its census? The answer, which we’ve learned previously in relation to Raytheon and other companies, involves the corporate intersection between military and civilian work, especially when it comes to IT and data analysis. Even by these standards, CACI has been prepared to get its hands dirty — very dirty. CACI (UK) Ltd is the company doing the census here, and the CSO has tried to distinguish between US-based CACI International and its wholly owned UK subsidiary, but it a distinction without a difference — at least in the view of the US parent company’s website, which boasts of its subsidiary’s Irish census contract. The UK company’s emphasis on civilian and public-sector contracts is consistent with part of the US business, but Virginia-based CACI has risen to $3 billion annual sales last year on the strength of its military efforts. 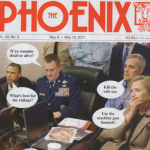 Irish-born journalist Andrew Cockburn, writing in the US political newsletter CounterPunch, recently described CACI as a perfect expression of today’s bloated defence industry, “in which a corporation can rise to great prosperity without making anything at all”. Founded in the 1960s to commercialise a computer programming language that could run simulations, CACI got new opportunities from the ‘war on terror’, including a contract to supply dozens of interrogators for the notorious Abu Ghraib jail in 2003. A 2004 Pentagon report said CACI contractors were involved in abusing prisoners in Iraq, and a 2006 investigation by journalists at Salon.com said CACI’s “Big Steve” Stefanowicz had been named in a court-martial and by other sources as having directed torture at the prison. Stefanowicz, who has never been prosecuted, no longer works for CACI, so it is unlikely the 6-foot-5, 17-stone interrogator devised the line of questioning on the census form. Cockburn calls CACI’s board of directors, packed with retired senior US officials, military brass and politicians, “a useful cameo of today’s military-industrial complex”. That complex is international: CACI’s website reveals it got its text-recognition software for the 2006 Irish census from Tel-Aviv-based Top Image Systems. But not to worry: in the unlikely event that Irish personal information somehow leaked out, it would be sure to be safe in Israeli hands. Some of the questions about the CSO and CACI have been raised via the ‘multistory’ project on itison.net, where one activist told how he presented the census enumerator with a homemade comic book documenting his census-weekend trip to the Giants Causeway (i.e. out of the jurisdiction). The friendly enumerator later told him that he wouldn’t need to fill in the ‘absent people’ section of the census form: his comic would suffice. Spookily, it has emerged that CACI International had a registered Dublin office for several years up to 2001 in the same Dawson Street building that contained the Forbidden Planet comic-book shop. Coincidence…?